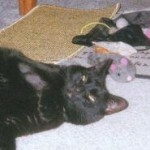 CAN SOUL RETRIEVAL HELP A CAT? PART I: The Situation and Making a Plan. 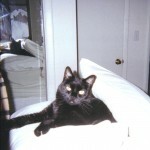 About 2 years ago, when Jennifer first called me, she described Cleopatra’s unusual behavior: “Whenever anything in the house would change – for example, a chair moved to a slightly different position, Cleopatra would change, too. This severe reaction to even the slightest change in her environment indicated to me that a homeopathic approach would be a good place to begin. I recommended a veterinarian in Manchester, Connecticut, whose homeopathic skills and insight are outstanding. According to Jennifer, Dr. Alexis Soutter felt that Cleo suffered from feline autism, which may have been brought on by vaccinosis. So for the last 2 years, Cleo was treated homeopathically and made significant improvements. Then, about a month ago, Jennifer decided that another cat, who had been abandoned and was living on her outside with some help from Jennifer, should become part of the family. This created a crisis situation for Cleo. The new kitty, Chloe, was eager to come inside and have a family again. Cleo seemed to be coping with this pretty well, until the day Chloe decided that she would become “top cat.” Chloe stood at the top of the stairs where the cats come in through the basement, baring Cleo’s entry. Then she stole Cleo’s food. Cleo immediately withdrew and the old patterns returned. Her fur became dull and she went into hiding. She no longer played and was afraid to eat, and when she did eat, she vomited right afterward. Jennifer gave Cleo her remedy that had worked so well before, but this time it only seemed to help a tiny bit. There is a third cat – Cleo’s very close friend – named Emme. Emme is loves, protects, and mothers Cleo. For years, she has nurtured Cleo, never challenging her, and thus allows Cleo to shine. But despite Emme’s efforts to hold Chloe off, Chloe continued to push herself into Cloe’s face and space, and Cloe continued to withdraw. Because Jennifer has developed a great affection for Chloe, Jennifer called me to see if I could somehow help these cats get along and especially to see what I might suggest to help Chloe, whose remedy no longer seemed to have the same restorative effects. After speaking with Cleopatra and Emme and Chloe, I offered Jennifer some options as to how to proceed. One option was to call Dr. Soutter and see she what she had to suggest. Sometimes a remedy needs to be given at a higher or lower potency, or an animal needs a different remedy altogether. A second option was to use some flower essences to calm things down. However, I really didn’t think that flower remedies would address Cleo’s deeper issues. My third suggestion was that we try an energy healing sessio for Cleo, with her permission, of course. I also explained to Jennifer that all 3 of these things might be used at the same time, but that she needed to choose what she wanted to do and the order in which she wanted to do them. Jennifer decided to get the flower essences going and try a healing for Cleo. Tune in tomorrow for Part II – Cleo’s healing session.